Say we’re hanging out with a friend on a Saturday afternoon. Our foreground intention is something like “having a connective experience with our dear companion”. A background intention is something like “channeling our greatest values—like harmony, kindness, love or discernment”. Now imagine yourself as being like that dog. While you’re on the couch in the middle of a conversation with your friend, you smell their roommate cooking lunch and, feeling a little hungry, you start hooting and hollering, and run from the couch to the kitchen and try to score some of that food. Ridiculous, right? The things that prevents you from doing this is mindfulness of intention. Dogs can’t operate on this level—they are fully enslaved to their whims. A big part of mindfulness practice is the ability to “step back”—fully feeling and experiencing our impulses, emotions, desires, ruminations and plans—BUT, perceiving them in context, seeing that they are not eternal truth and, in turn, that we have a choice on what to do with them. More practically, imagine you sit down to get some computer work done. Pay bills. Reply to some emails. Research something for work. Etc. As you sit down, you feel a little restless; and, rather than getting right on task, you surf the web, dilly dally, following every impulse to distract yourself until an hour has passed and you’ve gotten nothing done. This is sort of how “doggy mind” works. 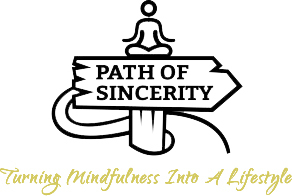 When mindfulness of intention is really strong, we can “step back” from the restlessness, “step back” from the impulses and stay gently and persistently on task. Of course, “presence” is really important. Actually experiencing our life rather than thinking about it. However, that’s only level one. The next stage is “stepping back” from our experience in order than we can channel our deeper intentions. We cultivate the next stage in baby steps; for example, what’s your deeper intention for the next hour? See if you can keep that in mind for a mere sixty minutes.